For other uses, see Panagia (disambiguation). 13th-century Great Panagia from Yaroslavl. Panagia (Greek: Παναγία, fem. of panágios, pan- + hágios, the All-Holy; pronounced "pah-nah-YEE-ah"), also transliterated Panayia or Panaghia, is one of the titles of Mary, the mother of Jesus, used especially in Orthodox Christianity. Most Greek churches dedicated to the Virgin Mary are called Panagia; the standard western Christian designation of "St. Mary" is rarely used in the Orthodox East, as Mary is considered the holiest of all human beings and therefore of higher status than the Saints. Such an image is often placed on the inside of the apse which rises directly over the altar of Orthodox churches. In contrast with standard religious mosaics which usually have gold backgrounds, the Platytera is often depicted on a dark blue background, sometimes dotted with gold stars: a reference to the Heavens. As with most Orthodox icons of Mary, the letters ΜΡ ΘΥ (short for ΜΗΤΗΡ ΘΕΟΥ, "Mother of God") are usually placed on the upper left and right of the halo of the Virgin Mary. By extension of this last sense, a panagia is an engolpion with an icon of the Theotokos, worn by an Orthodox bishop. They can be very simple  or extremely elaborate, depending on the personal taste of the particular bishop. 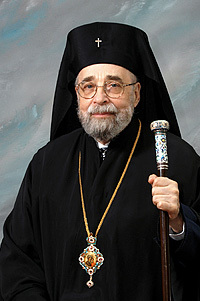 When an Orthodox bishop is vested for the Divine Liturgy or another service, he wears a panagia and a pectoral cross over his other vestments. 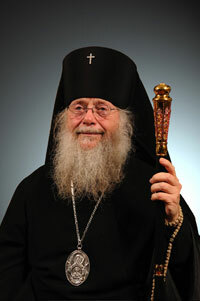 The primate of an autocephalous church, when fully vested, wears a panagia, a pectoral cross, and an engolpion of Jesus. Bishops of all ranks when not vested will usually wear the panagia alone over their riassa (cassock); this is often the detail that, to the casual observer, distinguishes a bishop from a priest or a monk. The panagia is usually oval in shape and crowned with a depiction of an Eastern mitre. Sometimes, bishops will wear a panagia which is either square (see picture, right) or shaped like a Byzantine double-headed eagle; this latter is especially true of Greek bishops. May God create a clean heart in thee, and renew a right spirit within thee, always, now and ever, and unto the ages of ages. Amen. After the liturgy, when the bishop takes the panagia off to unvest, he crosses himself, kisses the panagia and places it on the Holy Table (altar). After unvesting and putting on his outer riassa, he blesses the panagia, crosses himself again, and puts it on, before exiting through the Holy Doors to bless the faithful. The particles placed on the diskos during the Divine Liturgy. The large cube is the Lamb, the triangle to the left is the particle for the Theotokos taken out of the Panagia. Panagia may also refer to a prosphoron (Ἄρτος της Παναγίας, Ártos tēs Panagías, "Bread of the All-Holy") which is solemnly blessed in honor of the Theotokos during the Divine Liturgy (see Prosphora for details). From this loaf, a large triangle in honour of the Theotokos is cut and placed on the diskos (paten) during the Liturgy of Preparation. The remainder of the loaf is blessed over the Holy Table (altar) during the hymn Axion Estin, just before the blessing of the antidoron. The priest makes the Sign of the Cross with the Panagia over the Sacred Mysteries (consecrated Body and Blood of Christ) as he says, "Great is the name of the Holy Trinity." In some monasteries there is a special rite ceremony called the "Lifting of the Panagia" which takes place in the trapeza (refectory). After the dismissal of the Liturgy, a triangular portion is cut from the prosphoron by the refectorian (monk in charge of the refectory). The Panagia is then cut in half and laid crust downwards on a tray. The brethren will go in procession from the catholicon (main church) to the trapeza, and the Panagia is carried on its tray at the head of the procession. Once there, the Panagia is placed on a table called the Panagiarion. After the meal, the refectorian takes off his klobuk (epanokamelavkion and kamilavkion), and bows to the assembled brethren, saying, "Bless me, holy Fathers, and pardon me a sinner," to which the brotherhood bows and replies, "May God pardon and have mercy on you." Then, taking the Panagia in his fingertips, he lifts it up while saying, "Great is the name," and then the community continues with "of the Holy Trinity." The rite then continues with, "O All-holy Mother of God, help us!" with the reply, "At her prayers, O God, have mercy and save us." Two hymns are then sung while the refectorian, accompanied by a cleric with a hand censer, offers the Panagia to those assembled. Each takes a piece between his finger and thumb, passes it through the incense, and then consumes it as a blessing. From "Panagia" derive the common Greek given names Panagiota (feminine; pronunciation: Pah-nah-YAW-tah; common diminutives: Ghiota, Nota) and Panagiotis (masculine; pronunciation: Pah-nah-YAW-tees; common diminutives: Panos, Notis). Both names signify that the person is named in honor of Mary, mother of Jesus and consequently their name days are celebrated as if they were named Mary or Marios. ↑ The oldest known surviving manuscript contain the ritual of the "Elevation of the Panagia" is found among the manuscripts preserved at Dumbarton Oaks near Washington, DC. This page was last modified on 19 October 2015, at 02:51.